Astrobiology, the study of life and its existence in the universe, is now one of the hottest areas of scientific research, fusing together biology, chemistry, astrophysics, and geology. 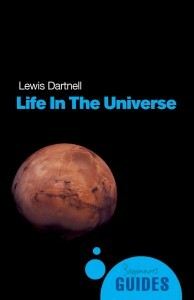 In this masterful introduction, Lewis Dartnell tours its latest findings, and explores some of the most fascinating questions in science. I found the book approachable and readable on several levels. It is part of a series called “Beginner’s Guides” and it serves that purpose well. Interestingly, it does not talk down to the reader. After a gentle, friendly introduction it starts discussing issues related to what is life, where is life to be found and so on. But it does so in an informed style using professional language. Having once myself been rebuked by a TV film crew for using a technical word which required a scene to be shot again (the offending word was hydrogen”), I am glad to see an author confidently use scientific language, and doing so in an accessible style. An enthusiastic teenager would get a glimpse into a scientific world where people are thinking about all those wonderful things she or he hears about and speculates on. And it is equally useful for a University level student or well educated adult who is not studying astrobiology but who wants to know what it means and if people have thought about this or that yet. There is a very short glossary at the end of the book, which is useful but could probably have been extended. The index is good as is the reading list (which includes popular science books as well as the usual scientific journal literature). The book is very reasonably priced, and as a small paperback reminds me of the study books one sees in German University towns, where permanent students sit in cafes reading about culture, philosophy and life’s great mysteries. I could easily see this book having a similar market. Since starting to read the book I have already mentioned it to at least two other people. One was a professional writer who wanted to know about basic astrobiology for an article she was writing, the other was a final year school student who just wanted to know more and was full of questions. In both cases I am sure the book was a much better source of information than a short conversation with me.